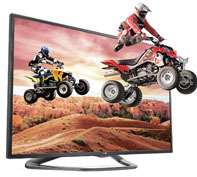 Price of LG 32LA6620 Full HD Cinema 3D Smart Exquisite Cinema Screen Design TV in India. This model of LG 3D Smart Television is with screen size of 32 Inch. Main features are Magic Remote with voice recognition, Smart share (NFC Tag on, Mira cast, MHL 2nd Display), Time Machine II, Comfortable 3D Glasses.